How Do Your Window Treatments Perform? At Bretz Interiors serving the greater Denver area, one of the biggest reasons we hear from clients about why they are seeking new treatments is that their current window coverings don’t perform to their satisfaction. Perhaps they don’t protect the interior from damaging UV rays. Or maybe they’re not energy-efficient. Some don’t filter natural light appropriately. And others don’t give the right privacy to a room. If you’re in one of these situations with your window treatments, perhaps it’s time for an upgrade. Speak with one of our professionals today! Energy Efficiency and UV Protection. The best window coverings can filter light, protect from harmful UV rays, and provide energy efficiency at the window by adding a layer of protection from the external elements and your home. Hunter Douglas window fashions filter out at least 75 percent of the sun’s harmful rays—and many of the products, when fully closed, filter as much as 99 percent. Plus, treatments like honeycomb shades are highly energy efficient and help cut down on utility bills. Privacy. When you look at your home from the outside, can you see through the windows into the rooms? Hunter Douglas, the leader in window fashions, takes security very seriously. They offer fabrics and materials in each of their product lines that will provide you with the level of privacy you want. Options. If you’re struggling with getting your window fashions to match your lifestyle and décor, you might not have the right treatments. 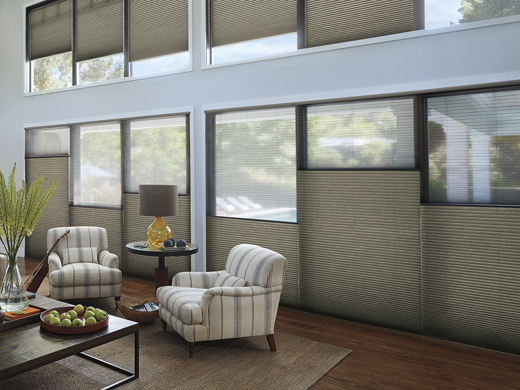 In all of its product lines, Hunter Douglas offers a wide array of fabrics and accessories to choose from. You’ll be able to find just the right touch to match your décor. Added value. Did you know that, oftentimes, window treatments like plantation shutters can add to the resale value of a home? Plus, if your window treatments have technological advances such as PowerView® motorization—which adds a level of convenience and security—you can also increase your home’s value to a buyer.